At a book signing back in November at the Julesburg, Colorado Community Library, I happened on a box of cookbooks that the librarian planned to weed. Cookbooks just happen to me. By that, I mean I cannot resist the temptation to buy bargain cookbooks that seem to magically appear where least expected. What can I say? It’s an addiction that I have tried desperately to break to no avail. I have looked for a Cookbook Anonymous group but if there are such groups, they stay well hidden. I also clip recipes and when my friend Rose, http://oldbroadsheet.blogspot.com, recently posted a blog about the collecting of recipes, reading it was like peering into a mirror except I’m not nearly as organized as my dear librarian friend. My clipped recipes just go into a drawer rarely to surface again for actual use. Periodically I do after much hesitation and anguish toss a few. A decade or so ago I did weed my cookbook collection, which at the time numbered in the hundreds. I managed to pull around ten, but have purchased at least three times that many since. The thing is, I read them. Sometimes, though I must say this happens rarely, I cook recipes I find within their pages. 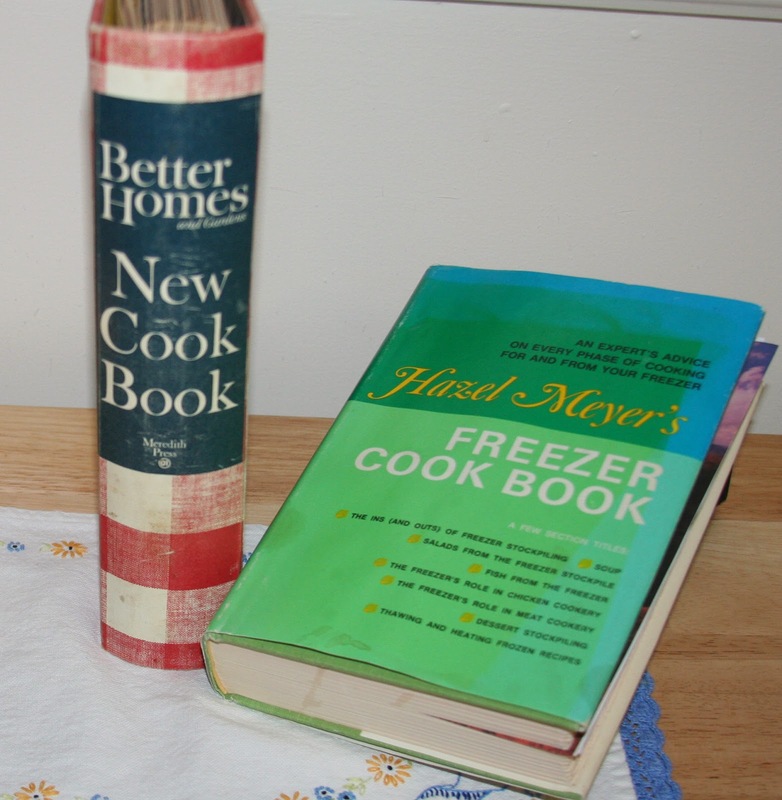 The one cookbook I do rely on often is my copy of Better Homes and Gardens “new” Cook Book. I purchased my first copy of the Better Homes and Garden Cook Book as a teenager and used it until it became so dilapidated that even masking tape would not keep the pages from falling out. Then, a few years ago I spotted a 1953 edition at an estate auction and determined to claim it as mine. The bidding started cheap enough at one dollar, but then the unthinkable happened. Someone bid against me. I finally managed to out bid the other bidder and bought the book for six bucks. Later I learned that I was bidding against then Haxtun Mayor Gay McDaniel. Gay, it seems, also has a fetish for cookbooks. However, I suspect she really does cook from hers. But, back to the Julesburg Library, which by the way is a beautiful building with a great history. If you find yourself near this northeastern Colorado town, it is worth spending some time exploring its many historic features, including this library built by local women’s clubs with Works Progress Administration (WPA) funds back in the 1930s. At the end of the book signing, I spent some time looking through the box of cookbooks and had nearly talked myself out of buying until one of the titles, Hazel Meyer’s Freezer Cook Book, flashed by my addicted brain cells. I paid a dollar, feeling that was a good bargain, and brought the book home. What really caught my eye was chapter two, “What’s Sauce for the Freezer Is Sauce for the Gourmet Cook.” Meyer’s not only includes recipes for basic white and brown sauces, but how to thaw the frozen portions and use them as a base for soups or other sauce variations. After reading the book (Remember that I read the cookbooks. ), I decided that, as a single cook, this one I could utilize and immediately went out to buy a stockpile of various cup and half-cup freezer containers. At the dollar store in a nearby town, I even found some tiny containers that hold 2.4 ounces. These I figure I can use to hold enough sauce, like say Hollandaise, to pour over a serving of vegetables. Yes, the book even contains a recipe for Hollandaise Sauce that can be frozen and thawed. Hip, hip, hurray (Me between the lines getting excited). I love Hollandaise Sauce, but could never justify making a whole batch just for one. Expect a report in a later blog; possibly included in one about planting asparagus in a blizzard. 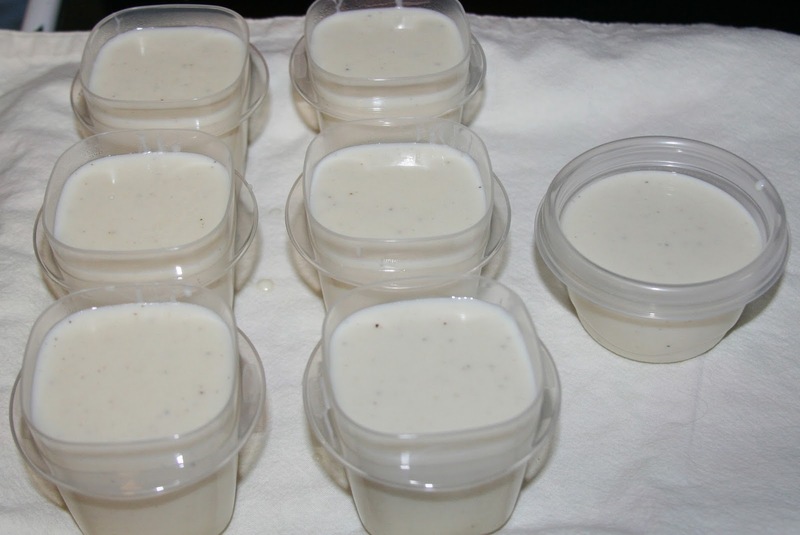 For now, I’ll start with Meyer’s basic white sauce, how to freeze, thaw and use in other recipes. The important thing to remember when making white sauce is to use medium-low heat so the flour cooks but does not brown. 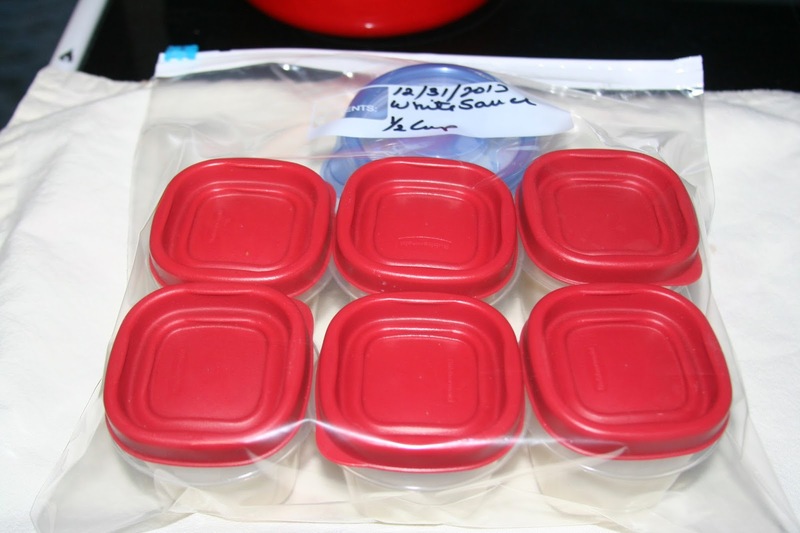 I poured the finished sauce into one-half cup containers, and then cooled those in the refrigerator for an hour or so before placing the containers in a gallon freezer bag, which is where I wrote the name of the sauce and the date placed in the freezer. This eliminates the need to mark each container and prevents the small containers from being scattered about the freezer. 1. Melt the butter in a heavy bottomed saucepan over medium-low heat. 3. Add the milk and continue to cook until the sauce thickens. Do not allow the sauce to boil. 4. Remove the sauce from the heat to cool, stirring often. 5. Pour sauce into ½ cup containers, allowing space for expansion as the sauce freezes. You should end up with seven half-cup containers. If you have any left over, toss it with a serving of cooked frozen peas for that night’s dinner. 6. To use, open the container and spoon out any frozen crystals from the top. Replace the lid and place the container in a pan of lukewarm water to release the contents. Dump the contents in the top of a double boiler set over simmering water. As the sauce heats, break it apart and whisk briskly to recombine. If the sauce seems too thick, you can thin it by adding a small amount of scalded milk. 1. Place container of white sauce in warm water to loosen. 2. Meanwhile, bring one quart water to boil in a three-quart saucepan. Add salt and Fettuccine, return water to a boil and cook until al dente, 12-14 minutes. 3. Meanwhile, fill the bottom of a double boiler with small amount of water (the bottom of the boiler pan should not touch the water. Heat the white sauce in top of double boiler using directions above. 5. Cut the broccoli florets into bite-sized pieces and steam in the microwave until crisp tender, 2-4 minutes, depending on the power of your microwave. 6. Stir the cooked, drained noodles and steamed broccoli into the sauce. Adjust salt if needed and pepper to taste. 7. Serve in a pasta bowl garnished with parsley if using. Note: A grilled chicken breast goes nicely with this dish, but it also makes a nice meal served with just a tossed salad. 1. Place the frozen dish of white sauce in warm water to loosen. 2. Meanwhile, bring one quart water to boil in three-quart saucepan. Add salt and elbow macaroni and cook until al dente, 10-12 minutes. 3. While pasta cooks, bring a small amount of water to a simmer in the bottom of double boiler (Do not allow the bottom of the boiler to touch the water). 4. Place the white sauce in the boiler pan and proceed according to directions above. 5. Add the cheese and continue to cook until cheese melts and blends into the sauce. Stir in the pasta. 6. Dump the sauce coated pasta into a 16-ounce oblong baking dish. Mix the breadcrumbs and Parmesan together then sprinkle over the top. Bake in a 400°F oven until the topping browns, 10-15 minutes. Serve as a side or as a main dish. How did one from the freezer turn out? I've never had much luck with re-using leftovers that had flour in them. It turned out really nice. I'm not sure, but I think the secret is the indirect heat of the double boiler, not allowing it to boil and also whisking to reconstitute.